If you eat seafood for Christmas Eve, consider trying this easy oyster chowder recipe. 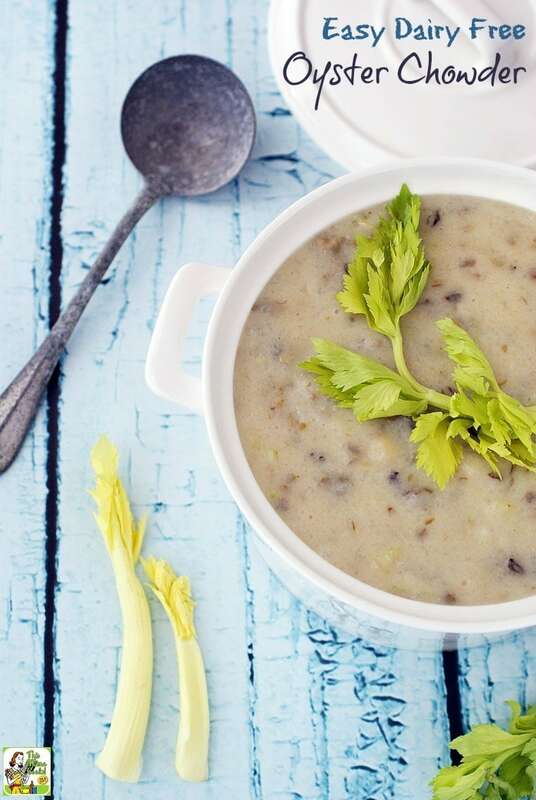 It’s a creamy dairy free soup recipe that’s perfect for anyone who’s also on a gluten free diet this Christmas season. 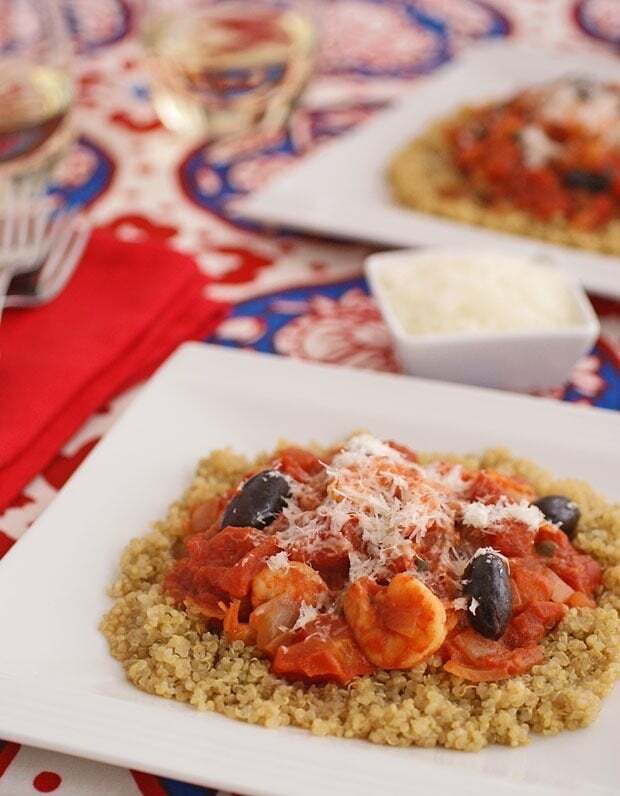 Your guests will certainly appreciate the time and effort you’ve taken to make sure there are Christmas Eve seafood recipes served that are dairy and gluten free. Most people I know have to bring their own food to the holiday feast! The reason I came up with this recipe for Easy Dairy Free Oyster Chowder recipe was due to a recipe challenge from Cook the Books. 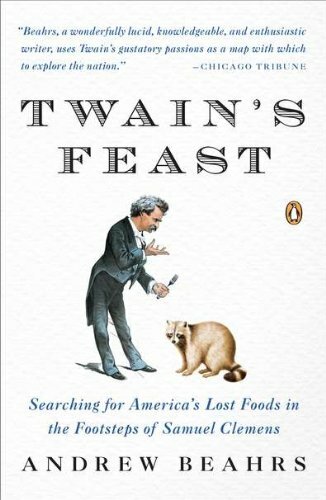 We were assigned Twain's Feast: Searching for America's Lost Foods in the Footsteps of Samuel Clemens by Andrew Beahrs. So different from today’s culinary adventurers who find bliss in every European bistro and sidewalk café and shutter to think of American fast food restaurants! 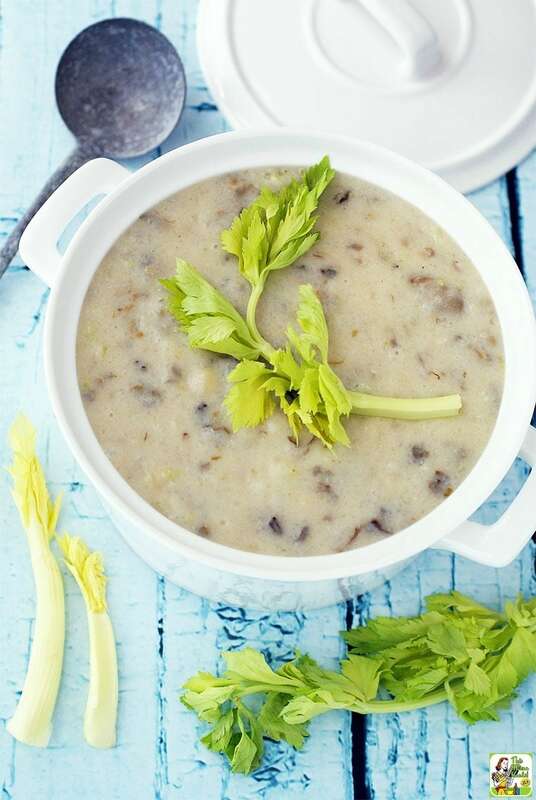 I wonder what Mr. Clemens would think of my Easy Dairy Free Oyster Chowder! Even if you’re not a big fan of Mark Twain’s books, if you love American food history, you’re sure to flip over Twain's Feast: Searching for America's Lost Foods in the Footsteps of Samuel Clemens. Andrew Beahrs takes some of the foods Mr. Twain mentions in A Tramp Abroad, digs deeper into how people enjoyed them back in Twain’s time, and shows us how so many of foods that were taken for granted, like prairie chickens and terrapin turtle, are gone or endangered now due to environmental destruction and/or overhunting. I was fascinated to learn how certain fish and oyster species no longer exist in their native habitats, like the native oysters in San Francisco Bay and the trout in Lake Tahoe. In fact, we’ve had to transplant other U.S. species just to keep up with demand and our changing landscape. Luckily there's oysters at the store for this dairy free seafood soup recipe! When Twain was living in San Francisco in the 1860s, oyster places were popular places for men (and men only!) to gather, talk, eat, smoke, drink – and drink some more. In 1892, according to Beahrs, Americans would eat 197,639,000 of dressed (meat only) oysters. It was the Age of Oysters! I find it sad today that most Americans go, “Ewwwww, oysters, how disgusting!” and won’t even eat cooked oysters let alone raw ones. Inspired by Twain's Feast, I decided to make an oyster chowder recipe. 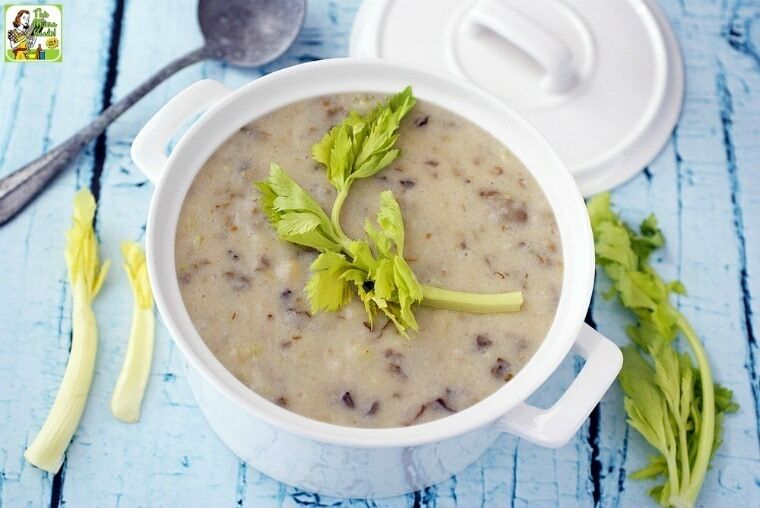 While I was recovering from brain surgery, one night for dinner my husband, Paul, made two versions of this oyster soup recipe – one with milk and the other with rice milk for me, since I have a food sensitivity to the whey in milk. The funny thing was that after trying both soups, we preferred the soup made with rice milk, which had a nice sweetness to it that complimented the taste of the oysters. The soup made with cow’s milk tasted like milk and then like oysters. It was kind of nasty, frankly. When Paul made his oyster soup, he hadn’t bothered to thicken either with a roux or cream, so I wanted to figure out how to thicken the oyster soup while keeping it both gluten free and dairy free. I decided to try two methods in my easy oyster chowder recipe. Maybe this was overkill, but it worked out nicely to thicken the oyster soup into a creamy oyster chowder that was both gluten and dairy free. 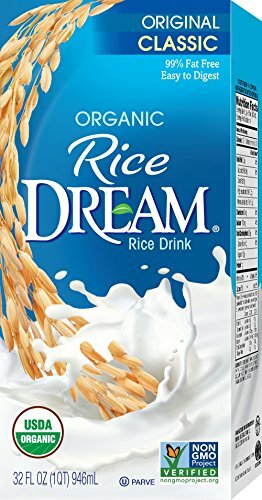 First, I added cooked rice to rice milk, heated it up, and then used an immersion blender to create a super thick rice milk broth. Second, I cooked up a roux with an all purpose gluten free flour and a non-dairy buttery spread. While this served to further thicken the chowder and give it a velvety finish, it also added a lot of buttery flavor to the stew. If you’re used to making a roux with regular flour and butter, don’t expect a gluten free flour and buttery spread roux to brown. It just won’t. If you wait around, it’ll just start getting crusty and burnt. About the oysters. 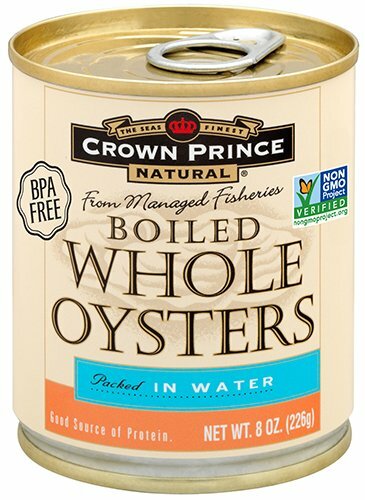 I used canned whole oysters and was pleasantly surprised of their excellent quality. The oyster liquor tasted great and the oysters themselves were plump and fresh smelling. I did find fresh (dressed) oysters at one of my grocery stores, but I’m always a bit weary of grocery store seafood. Plus, eight ounces of (dressed) oysters were $6 versus $2.49 for the cans. I don’t want to assume you have access to fresh oysters or the budget to purchase them. Ideally, if I lived closer to Atlanta, I would have driven to one of the terrific Asian supermarkets like H-mart. They all carry high quality fresh seafood and will shuck fresh oysters for you to use in your Easy Dairy Free Oyster Chowder! If you have Asian markets like H-mart or small mom and pop stores near you, make sure to give them your patronage. 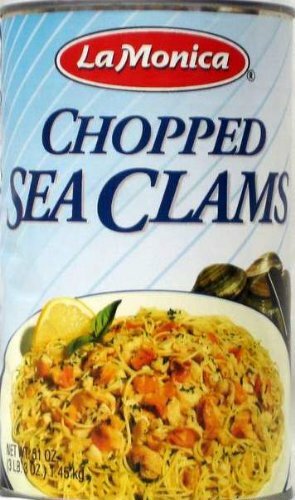 Finally, if you don't like oysters, feel free to use canned whole clams instead as this recipe would also make a fantastic clam chowder. Add a bag or two of frozen diced potatoes at the end, heat through on medium, and you're ready to go! Looking for more easy seafood recipes? Then try Crab Pasta with Pesto, Mushrooms & Tomatoes. Heat 4 cups of rice milk and white rice in a large pot slowly over medium heat, stirring occasionally. Bring to a low simmer. Add remaining 3 cups of rice milk and bring rice broth back to a low simmer. Reduce heat to low. In a separate skillet, melt the buttery spread over medium to medium high heat for the roux. Add the gluten free flour tablespoon by tablespoon, stirring it in until the flour is totally incorporated. Cook and stir for 2 minutes. Add the minced shallots, minced onions, and the reserved oyster liquid. Cook until the celery and shallots are softened, about 5-7 minutes. Add the roux, shallots and celery mixture to the rice broth. Stir until fully incorporated. If chowder seems too thick, you can add more rice milk if you like. Add oysters to the chowder and season with salt and white pepper to taste. Cook until heated through and keep on low heat. Originally published March 31, 2014. Updated with new pictures and information. Posted in Christmas, Gluten Free, Recipes, Soups and tagged dairy free, seafood on December 21, 2016 by Anne-Marie Nichols. Isn’t it exciting to rediscover an author known from childhood and learn that he/she has aspects that one never noticed at the time? I truly enjoyed the read, and with oysters being among my favorite shellfish, this recipe too. Thanks! Great post. I know that I didn’t find out how much I loved oysters until I ate them super fresh. I would think you’d have no problems getting fresh shellfish where you’re at, Deb! 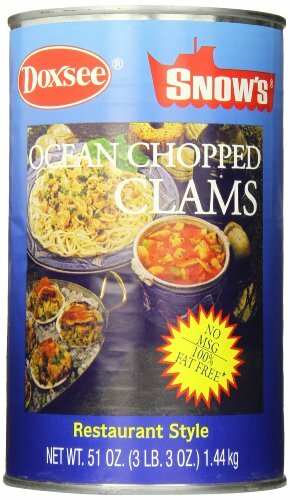 But the price can’t be beat on the canned stuff, especially when the oysters at the seafood counter looks a little suspicious! I really like the sound of your thick rice-milk broth as a base. That sould be so versatile! Fresh oysters are fortunately easy to come by here on the West Coast, so I guess I have no excuse not to try making some chowder. I really like your description of the process you go through to make a recipe that you can eat. If I ever try to make a gluten-free roux, I will remember your warning. Lovely photos, too: they make me want to pick up the spoon and dig in. Thank you so much for contributing to Cook the Books. We both had oyster inspiration from Twain’s Feast! Great recipe. I’ll have to check out the canned oysters. My mother-in-law always used fresh oysters in her Scalloped Oyster recipe, but you are right, the price is much higher, and if the quality is the same, I’d just as soon go for the canned oysters. Lovely photos. Your lighting is great. So glad you joined us for Cook the Books! People don’t appreciate oysters enough, Rachel! So glad you made a gluten free oyster dish, too. 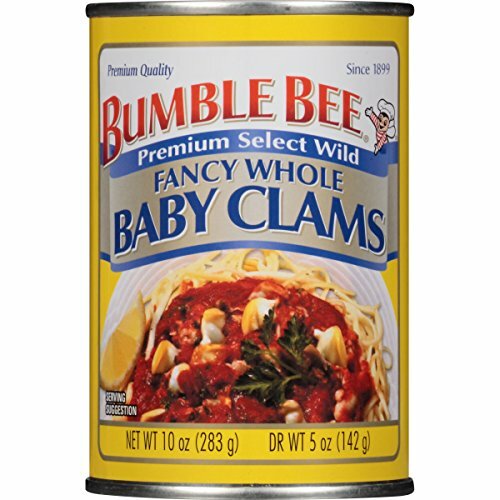 And unless you have a good fish monger that you swear by (my mom did when I was growing up in NJ – Bayshore Charlie’s) going with canned oysters is a good solution and much easy on the food budget, too.